If you've never tried making biscotti cookies before here's an easy recipe sure to impress your friends. The stiff cookie dough is easy to form and the double baking process is not as difficult as it sounds. 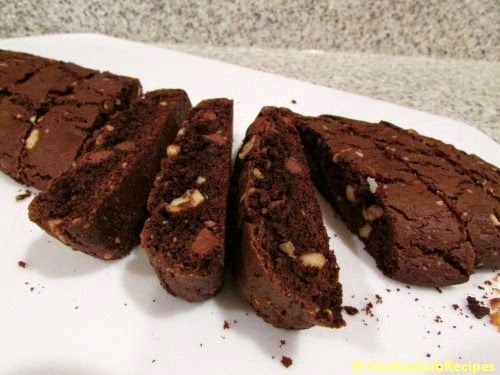 The original recipe, submitted by one of our Cookie Club members years ago, called for walnuts. However, to save money, you can use whatever you have on hand. Almonds, macadamia nuts, pecans, or even peanuts. If you do not have Dutch processed cocoa, regular unsweetened cocoa powder will be fine too. 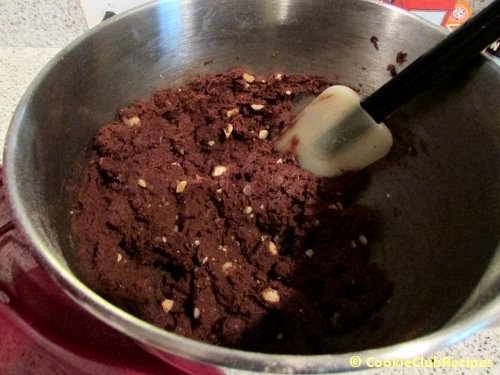 You can also substitute any flavor of chocolate chips, just do not omit them completely. 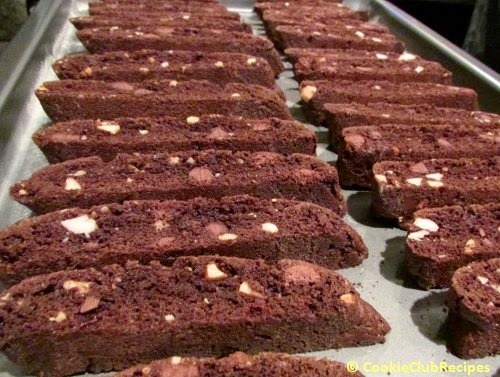 The extra chocolate chips make this biscotti rich and fabulous, especially when dipped in a hot tea or caramel mocha. OMGoodness!!! Prepare large baking sheet with butter and a light dusting of flour. 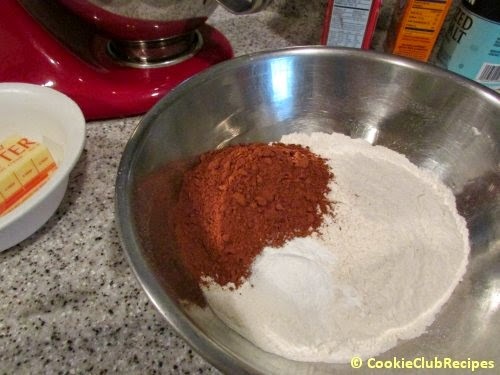 In a medium size bowl, whisk together flour, cocoa, baking soda, and salt. Set aside. In large mixing bowl, cream together butter and sugar until light and fluffy. Add eggs and beat just until combined. 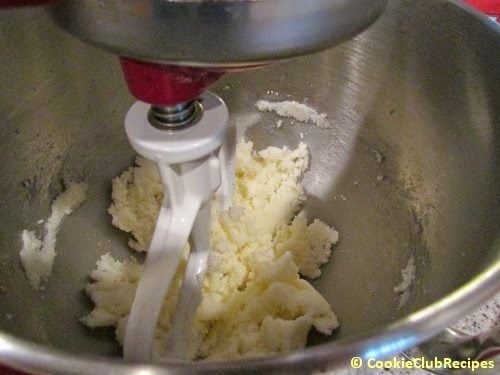 Add dry ingredients to butter mixture, one third at a time. The dough will become stiff and start to pull away from the sides of the bowl. Stir in chips and chopped nuts. 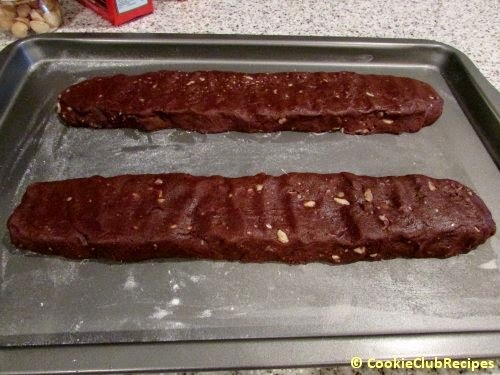 With floured hands, divide dough in half and form into two slightly flattened logs and place on prepared baking sheet. (See photo below.) Each portion of dough should be about 12 inches longs and 2 inches wide. They will both fit on the same baking sheet perfectly. 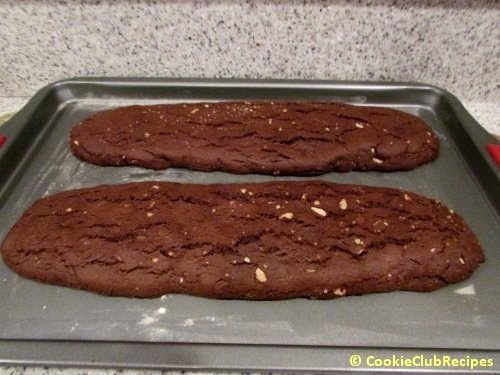 Although they will expand a bit during baking, it's not enough for them to touch. So don't worry! Bake at 350 degrees for 32-35 minutes. My current oven runs a bit hotter than a few I've had in the past, so 32 minutes was just perfect. 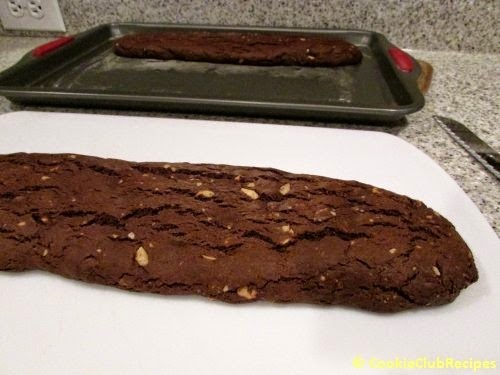 Remove biscotti from oven and cool for 5 minutes directly on baking sheet. Do not let them cool any longer than 5 minutes; they are easier to slice while still warm. 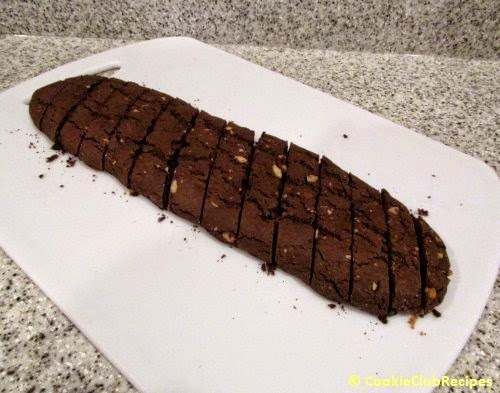 Place biscotti on cutting board and use a serrated bread knife to slice diagonally; about 1-inch thick. Return slices to the same prepared baking sheet, cut side down. Bake again for about 8-10 minutes. 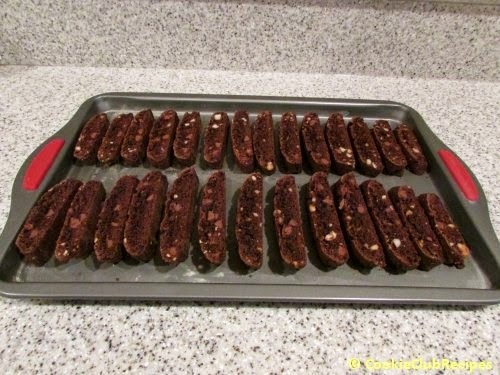 The crisp cookies can be easily and immediately removed from baking sheet to a wire rack for cooling. I used a flat spatula to scoop up several at a time.